I’ve learned about gardening over the years from my dad, gardening books, and the internet. I’ve also gotten lots of ideas by checking out other peoples’ gardens and small farms. Right here in my own zip code there are some great gardens going on in front yards. I love to see what other gardeners are doing. It seems that most folks who keep their gardens in their front yards do so because their back yards are either too shady or there’s not enough space. We moved our garden to the front yard because of the two giant spruce trees that line the southern side of our backyard, plus our front yard is flatter. Moving the garden to the front yard has made gardening a much more social experience for me. Neighbors tend to stop regularly on walks to check out what’s growing. I can also find people to give vegetables to when everything seems to start coming in at the same time in late summer. 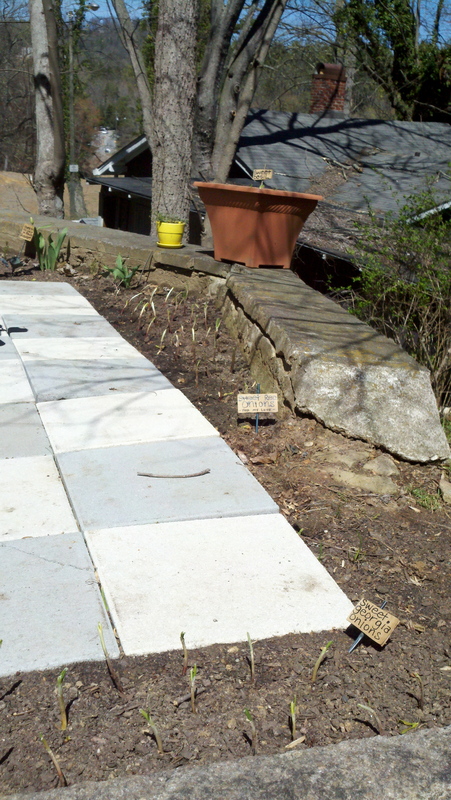 Just a few blocks from our house there’s a great garden that I pass on the way to preschool. 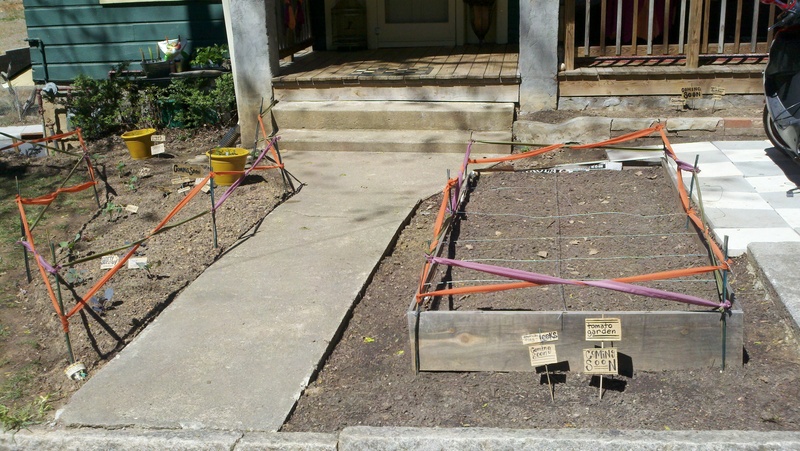 The entire front yard has been turned into a neat system of raised beds. When I was on a run last week I noticed the owners were home and in their garden so I got a chance to meet them. Candice was kind enough to let me interrupt her potato planting and tell me about what she and Alsace are growing in their front yard this year. The bed to Candice’s right is the beginning of her potato bed. She explained to me that she’ll keep adding boards and soil vertically as the potato plants grow. We talked about the challenge of getting water to the lower layers as more soil gets layered on. I told her about something I’d seen on the internet about putting a soaker hose near the bottom layer to keep the plants from getting too dry. On the far right of the picture is their rain barrel that a friend made for them. Up close to the house but a little hard to see is a cold frame that Candice made. I asked them if it was OK if I follow their garden’s progress through the season on my blog and we got a chuckle out of the idea that they’ll have pressure to keep the garden going strong. It’s the same kind of “pressure” I felt when James and I first started gardening in the front yard — I felt like we’d better keep the weeds out and everything looking good, while I hadn’t been so concerned about those things when the garden was behind the house. 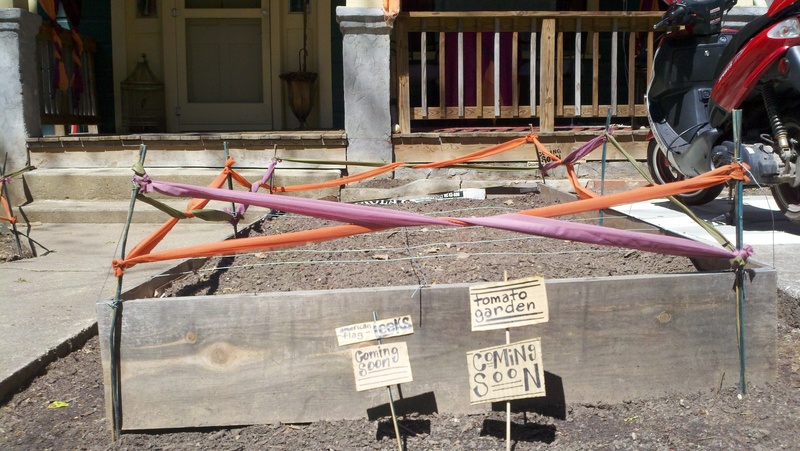 These gardeners have managed to turn almost every square inch of dirt in their front yard into growing space, complete with cool signage letting everybody know what to expect to be coming up later in the season. Another benefit of front yard gardening: less grass to mow. Or in the case of the two gardens above, no grass to mow! Maybe when we build the new house, we can put a garden in the front yard. Which vegetables make the prettiest foliage? If you want to plant veggies that are aesthetically appealing in your front yard, I think alot of it has to do with how you group the vegetables, and what colors the plants are Something as simple as the light-green tops of carrots look cool when you got a big group of them next to something like the dark-red/purple of beet leaves. Later in the summer, bush bean plants are nice with their small white blooms. I’d stick to the determinate varieties of tomatoes because they don’t get as leggy and wild as indeterminates. You can mix in all kinds of flowers too . If you’ve got good-looking raised beds in a durable wood (like cedar) then you’re off to a good start!